I flew from Indianapolis to Chicago today, which is probably as good for my carbon footprint as driving two blocks to the grocery store. While I am grateful for the free plane trip that Quaker Oats provided so I could attend their Living Proof weekend, the practical part of me thinks I should have just taken the bus. When you add all the time it takes to ride the shuttle from long-term parking to the airport, get through security, and ride the train into the city, I doubt I saved any time. However, I probably wouldn’t have met Rod, the homeless tour guide either. As I was walking on the cold, gloomy streets of Chicago, I ducked between two columns of a bank building to look at my map I’d hastily purchased at Borders on the way out of town. Rod asked if he could help me and then walked me 6 blocks to my hotel. I did not immediately “make” him as a homeless man. He was dressed in jeans, a blue jacket, and a hat. He was well-groomed, freshly shaved, and looked like any other Chicago citizen. He said the advertising company that he was the janitor at moved to Europe two months ago and he’s been living at the YMCA for $30 a night since then. I don’t know if any of that is true, but he seemed sincere enough. Of course, I am highly gullible and a tourist to boot, so he might have been spinning this tale for years before the current economic crisis made layoffs so widespread and his story more likely. I didn’t feel threatened by him, nor did I feel overly pressured to pay him, but I decided to give him a $20 and I’m 95% sure that money will not go to a local neighborhood drug dealer. I probably would have only given him a $5 if I had one on me, alas I’d just gotten some $20’s from the ATM before leaving and I doubt Rod was going to make change. Now I’m at the Hard Rock Hotel. I went to the bathroom as soon as I got in and I was halfway through a tinkle when I looked out the huge window in the shower on my right and realized any businessman in the building across Michigan Street could take a gander at my fleshy white thighs. I hastily pulled the shower curtain shut. Now I’ve made a cup of coffee and I’m settling in nicely, hoping the coffee I just brewed is as free as the Wi-Fi. 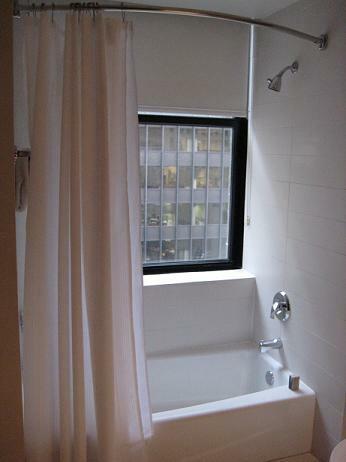 ETA: @Kari – That’s right, a window, in the shower. Did I read that right… a window IN the shower? hee – you said tinkle. I think this is one my favorite posts. Have a great weekend and enjoy your weekend. how are you supposed to TAKE a shower with the big window?? @rebecca – I can pull down a shade. Never fear, I won’t be giving a free peep show. Oh, wow. A WINDOW. In the SHOWER. Weird. And . . . quite uncomfortable, even with a shade. I find myself wondering what the possible intent could BE for a window IN the shower…as if someone might want to leave it open when they showered? I guess to each his own…LOL. I LOVE a window in the shower…I have one in my bathroom…but the glass is not see through, so no neighbors get to see me…phew! But I love when the sunlight comes in, I feel like I am showering in sunshine. Hey PQ, none of those business men know you, why not make their day? tee hee…. when you are outside – look up and see if you can see anything. It might be that you can look out – but no one can see in. have a great time. Just finished reading the entire blog love it. I am linking to this page everywhere I go…hope the book is going well. Is it too late to get to this meet up this weekend? Like “still reading”, I also have a shower built around a window. Unlike “still”, I wish it wasn’t there. The sunshine has the opposite affect on me. I guess I have too much Gollum in me. I like it dark. I once gave a valet $20 for driving my car 20 feet. It’s all I had and like you said, how do you ask someone for change? Hope you’re having (pain-free??) fun. That was so nice of you to help the man who helped you. I can’t believe there’s a window in the shower! Have an awesome time in Chicago. I also wanted to let you know that I just finished your book and loved it THANKS for writing it. LOL about your bathroom!! I closed the shade to take my shower this morning but when I realized the window was fogging, I opened it back up – let the businessmen working on a Saturday see a blurry me! Ohhhkaaaay. Be sure to check for telescopes across from your room. That was very kind of you to give the gentleman money. Alot of people wouldn’t have thought of that. I think midwesterns (not trying to stereotype anyone) are genuinely nice (that goes for both you and him!)!!! We ate pizza one time when we were visiting Michigan Ave. and had leftovers. Daughter felt some guilt and gave it to a gentleman on the street and he didn’t hesitate to take it. @still reading – I’m with you! I love having a window in the bathroom and sometimes, the shower/bathtub is the only place it can be! Having real light in the lav is great.